La Bastide en Ardeche is a beautiful campsite which benefits from spectacular views and a truly wonderful location deep in the heart of the Ardeche countryside. Lying on the banks of the Ardeche river, La Bastide en Ardeche is located in the grounds of the Chateau de Sampzon which was built in the 17th Century and sits on the hill towering over the campsite. La Bastide en Ardeche is set in a brilliant location with plenty of woodland and grounds to explore, along with direct access to its own beach along the banks of the river. The riverside beach makes this campsite extremely popular with families and those wishing to take part in water sports like fishing, canoeing and kayaking. Although one of the main attractions with La Bastide en Ardeche is its beach and direct access to the river, it shouldn’t be forgotten that the campsite also offers a great range of other activities. One of the great things about campsites in the Ardeche is the great outdoors. There are plenty of places locally to explore by foot, bicycle, car or canoe. So whatever type of holiday your family love, you can rest assured that you’ll be able to find something to please you at La Bastide en Ardeche. This fantastically authentic French campsite also boasts a lovely little swimming pool complex which is fantastic bearing in mind you have the river to swim in. A great family pool, children’s pool, two water slides and a lovely sun terrace are all present and ready for you to have a fun time in the summer sun. 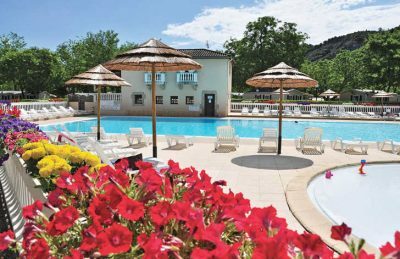 La Bastide en Ardeche campsite offers a comprehensive selection of activities and facilities on site and also nearby to ensure you have a fantastic family holiday. On-site activities at La Bastide en Ardeche campsite include table tennis, football, basketball, badminton, volleyball, running track, gym, boules, fishing, horse riding, canoeing, kayaking, playground and cycle hire. Facilities available at La Bastide en Ardeche campsite include WIFI, restaurant, snack bar, pizzeria, takeaway, bar, groceries, games room, tv room, animation team, washers and dryers. Accommodation at La Bastide en Ardeche campsite includes a range of 2 and 3 bedroom mobile homes and tents that are available from Eurocamp and Suncamp.